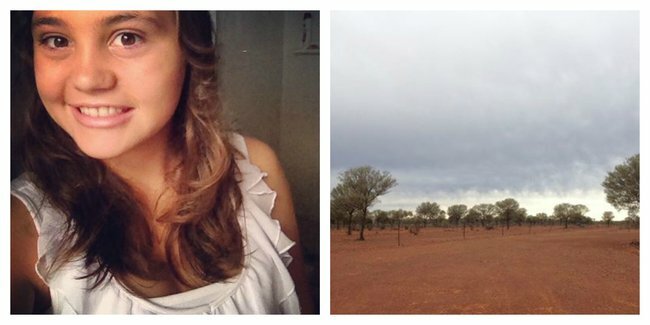 Teen on life on farm during drought: her heartbreaking letter. Bush teen pleads for Aussies to donate locally before sending money overseas. No money, no phone, dodgy internet and dying cattle — this is the reality of farm life in drought affected Queensland, according to someone who knows. Lucy Bain is a 16-year-old girl growing up on a remote 38,000 hectare property near Quilpie in central south western Queensland. Recently a visitor to her high school asked her to donate money to Cambodian farmers to help ease the effects of an ongoing drought. While she was sympathetic to their plight, something about the request didn’t sit right. “Cambodia is a poor country I know that. I’m not trying to say we shouldn’t help them but we as a country need to fix our own backyard first,” she wrote in a Facebook post. Read Luci’s full post here. She describes the grim reality for many families in a place where just a few years ago up to five farmers a week were taking their own lives. Clearly the post has hit a raw nerve because it has now been shared more than 30,000 times. The visitor, from the Lutheran World Service, had "no clue", according to Luci. "What bothered her was the visiting woman&apos;s suggestion that Australian farmers could just "buy more seeds" if their crops failed," she wrote. "Her words told us that if Australian farmers don&apos;t produce a crop it&apos;s not the end of the world because they just head into town and get more seeds to try again. "It really ticked me off to hear how many times she had been to Cambodia to see their drought and told all of us at school that it&apos;s so much worse than Australia&apos;s when she had never been to Australia&apos;s own outback to see how bad it really is." Luci says she wants to live in a country where farmers are supported and that while things in her area are improving at present drought is a constant threat. "Drought is a part of this vast country I like to call home. And one day the drought will be over but one day it will be back. "I didn&apos;t write this to say that you shouldn&apos;t help Cambodia but if your reasons for helping Cambodia is a need that is in Australia as well just use your brain and think for a moment about where you live and what it&apos;s like to see people throw money at another country while you sit there with a gun in your hand waiting to see if anyone cares. "Australia...the more you put in now the less fighting we have to do in the future." Watch: Another Australian teenager, Chloe Scott, started her own an online petition calling for a review the milk pricing system in a fight to protect dairy farmers.